League 2 gets underway on Saturday and I decided it would be an interesting idea to write a regular set of articles as the season progresses looking deeper into some of the stats from the league. There are plenty of people out that that write regularly about the Premier League and the Championship, as well as numerous other leagues around Europe, but I have not yet come across a regular stats-based article for League 2. Hopefully this might prove to be of some interest to people as the season progresses. Which team will succeed Burton Albion as champions of League 2? One of the difficulties of using stats to make predictions across seasons in League 2, as is the case in many other lower divisions around the footballing world, is the significant turnover of players that we see. While Premier League clubs may be classed as busy in the transfer window if they bring in three or four new faces, League 2 clubs often see wholesale changes with key personal moving up the divisions or to rivals, whilst fresh new faces from the academy or released from clubs higher up the pyramid make their first real foray into professional football. As a result, I am not going to make any precise predictions at this stage, but I will briefly talk about a couple of teams and storylines to watch as the season progresses. Expectations are high at the Abbey Stadium this coming season as the club has invested heavily in a number of talented new acquisitions. Having used their first season since promotion to set the foundations, they have shown great ambition, particularly funded by the pair of FA Cup ties against Manchester United last season, in bringing in the likes of Barry Corr and their former player, Luke Berry, to drive the club's promotion charge. Last season, they were very much lower mid-table from a statistical viewpoint. They had a TSR (total shots ratio) of 46.9, which ranked 19/24 in League 2, while their SoTR (shots on target ratio) was slightly better at 48.4, which ranked at 14/24. Their 61 goals scored was the sixth highest, but they were let down defensively as their 66 goals conceded was the sixth lowest in the division. This poor defensive record was borne out in the fact that only five teams conceded fewer shots per game than Cambridge's 10.96 and their ExpG conceded was 54.4, which ranked 17/24 in the league. Arguably though, they may have overachieved going forward with their 47.4 ExpG scored ranking just 14/24 in the league. This would appear to be partially down to a 75.0% conversion rate from close range headers, compared to an overall league average conversion rate of 43.0%. The key players to look out for are likely to be Barry Corr, whose 11 non-penalty goals helped to fire Southend into League 1, while Mark Roberts and Elliott Omozusi have both dropped down from League 1 to help shore up the defense. The future looks promising for Cambridge, although plenty will depend on how the team gels. They have a relatively easy start to the season, but if they struggle to click early on, it could be a rough ride for one of the fancied teams in the division. Generally there is a pretty reasonable correlation between TSR/SoTR and total points, but in the two seasons since Wayne Burnett took over at Dagenham and Redbridge, they have been a clear anomaly. In his first season, he secured an excellent finishing position of 9th with 60 points, despite having the lowest SoTR in the division and the second lowest TSR. A PDO of 105.2, the fifth highest in the division, seemingly helped. Just when you might expect the team to regress back, they recorded a comfortable finish of 14th with 59 points, just one point lower than the previous season. This was despite seeing their TSR and SoTR fall even further to 0.419 and 0.378 respectively, both of which ranked 24/24 in the league. This time, they were aided by a huge PDO of 115.1, the second highest in the past 12 years in League 2. Their average shots against of 12.07 was 23/24 in the division, their ExpG conceded of 60.7 was 24/24, they conceded more shots from the most dangerous areas than any other team in the division, their ExG scored of 42.6 was 20/24. Really, there appears to be little evidence for how they achieved the points total that they did. The only hint might be that they were very effective at creating chances from 'Very Close Range', ranking 5/24 in that category and were very efficient at converting those chances. Jamie Cureton's five chances from very close range were only beaten by three other players in the division - Matt Tubbs (6), Adebayo Akinfenwa (8) and Jake Hyde (9). It would appear that continuing to create these very good chances for Jamie Cureton will be key for Dagenham and Redbridge to continue to defy the statistics and maintain their place in the division. If we see a decrease in the chance quality for the Daggers, their fans will be nervously looking over their shoulder at the drop zone. If there is one thing that Michael Appleton will be hoping for this season, it is an improvement in performances at the Kassam Stadium. Last season, Oxford's stats looked pretty solid. Their TSR and SoTR of 53.9 and 55.5 both ranked 6/24, but a PDO of just 93.8 was 23/24 in the division and was a big problem for them. The concern would be that it was not driven by issues in just one of the components, but in both, with their scoring % ranking 17/24 and their save % at 20/24. One major area of concern would have been the 53.0% save percentage at the Kassam Stadium, which ranked 24/24, and the fact that the next lowest was 59.3% shows how poor this was. Conversely, their save % away from the Kassam was 78.8%, which ranked 3/24 for away sides, which could either be down to different styles of play at home compared to away or simply bad luck. 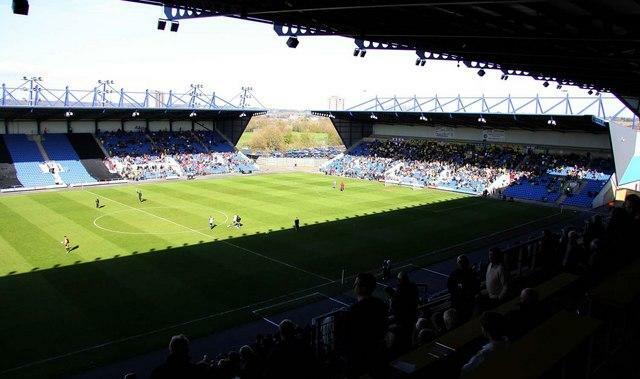 Can Oxford United improve their record at the Kassam Stadium? Looking at the shot locations, we can see that they conceded 16 goals from 23 shots on target in the central area of the penalty box at the Kassam Stadium and given that they allowed just 51 shots on target at home all season, the fact that 29 of those came from the danger zone will be a concern. Having said that, the average conversion rate for chances from the central area in the division was just 16.1%, so whether this was down to very bad luck or poor defending and keeping is tough to tell from the stats. However, having spoken to an Oxford fan, he informed me that they tended to play a very high line early on in the season and that there were a number of mistakes from defenders that meant that plenty of the chances conceded were one-on-one with the keeper, which hints at the poor defending approach. Away from home, just 44.6% of the chances that they conceded were from the danger zones and they conceded just 8/25 in the central area, so still above the league average, but far fewer than at the Kassam Stadium. Given the majority of teams tended to concede higher quality chances away from home, this is a striking difference and might hint at a different style of play adopted away from the Kassam. The arrival of George Baldock appeared to mark a turning point defensively for Oxford last season, so they will be delighted to have brought him back in on loan again. Sam Slocombe is an upgrade in goal, while the return of Kemar Roofe (0.47 NPG/90) and Ryan Taylor (0.3 NPG/90) should boost their options going forward. They will also be looking to involve 19-year old academy graduate, James Roberts, more this season after he recorded an impressive 0.48 ExpG/90 from 616 minutes last season. League 2 Stats: Can We Trust the Data? League 2 Stats: Better Lucky Than Good?